I super like paisley, this classic textile pattern is characterized by colourful, curved figures; it is named for the shawls manufactured at the town of Paisley, Scotland. When, about 1800, patterned shawls made from the soft fleece of the Kashmir goat began to be imported to Britain from India, machine-woven equivalents were made at Paisley to supply the insatiable demand that had been created for “cashmere” shawls. Paisley shawls, in silk and cotton and later in wool, with sober colouring, were beautiful in their own right. Their rich, abstract, curvilinear patterns, modified from their Kashmir counterparts and deriving ultimately from Mughal art, have continued to be widely adopted in modern textiles, especially for clothing. 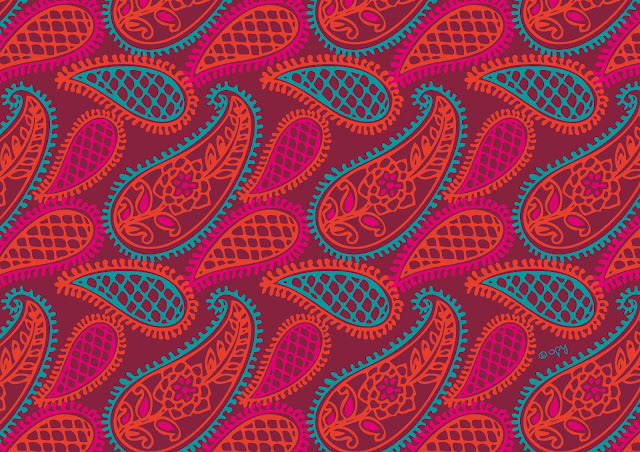 A motif resembling an enlarged comma (well-known in Mughal decorative art) is the one by which most people recognize a paisley pattern. Y nosotros lo llamamos diseño BULGARO, fijate....qué buena historia tiene...Lindísimos los colores, muy parecidos a la de una pashmina que me mandó Guille desde Turquía...A medida que te acercás al patrón 53 te vas superando, Florcita...Qué bueno<!!! !te amamos!!! !